Balloons, Geese, and Worms, Oh My! I'm a newbie when it comes to inquiry-based/Reggio-inspired learning, and while I don't know if I'll ever be able to say "I'm doing it," I do know that I've experienced a big shift in thinking. I'm looking through new eyes, listening with new ears and this has changed everything! 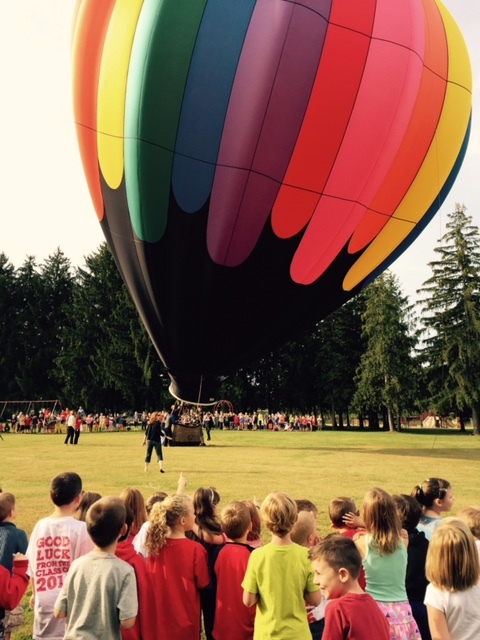 Today, our PTA organized a hot air balloon assembly, and we gathered outdoors. I found myself watching and listening to the children closely. I wasn't wondering how long this would take, or contemplating what I should cut from our ELA block. I was really listening and genuinely interested in their reactions. The "balloon man" released a helium balloon as a way of signaling that he was ready to begin. The kids were fascinated watching it move through the air. Where will it go? they kept asking as they cheered it on. They followed it with their eyes until it was pin-sized and then disappeared. Some claimed to be able to still see it, even though I know they couldn't (cue up I Believe from The Polar Express). Meanwhile, the hot air balloon was being inflated and while there was definitely some interest here, it was soon diverted when the geese flew over in a v pattern. "They're going to Florida," one child said. The hot air balloon continued to get bigger and was almost ready for launching when someone spotted a worm. Several gathered around to see it. They began to place grass over the worm and when I asked why, they said because the worm needs to be underground. 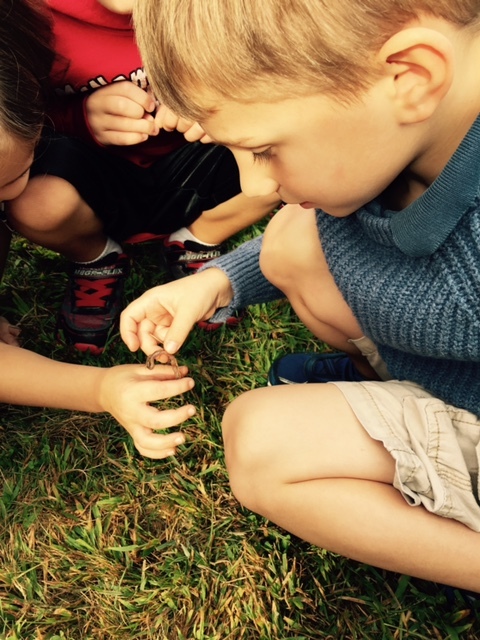 Then, they found another worm and were cautioning others to be careful where they stepped. The interest in the worms endured. I was hoping to take them back to the "worm spot" in the afternoon, but there was an inside portion to the balloon assembly that didn't make this possible. At the end of the day, I asked a student, what "small moment" did she want to remember about September 25, and she drew a tiny worm on the calendar card. Today they had front row seats to a hot air balloon. There was fire and they saw their principal being lifted off the ground. But in the end it was the worms they found most captivating. I only know this because I was really listening, not telling them to simmer down, or get back in line, or stop picking the grass. The joy, the wonder, the curiosity, the possibilities for learning - I'm loving my new view!